Last weekend was a big weekend of racing for Goalpecific athletes in Vichy, France and there were some massive achievements! Simon, Laura, Clodie, Terri, Nige and Ade were all toeing the line for the 70.3, with Laura back for more after a mechanical cost her in last year’s race. The water temperature on race day was above 25 degrees so that meant non-wetsuit swim. So here are the results….. Started off with a 47min swim which was off his normal pace due to the non-wetsuit conditions but then followed it up with a storming 2hr48min bike and an excellent 1hr52min half marathon to finish in 5hr45min – a great performance! Laura was suffering from an achilles injury and hadn’t run for a few weeks but she was absolutely determined to be on the start line. Her swim was faster than last year at 49min and she followed it up with a solid 3hr23 bike before heading out on the run. Just over 2hrs on the run and Laura was home in 6hr29min – an excellent execution of the race in tricky circumstances. Superb racing from Clodie all round as he begins to get back to full speed and hoping to move towards those podium places again. Good, solid 39min swim was followed up by and excellent 2hr50 on the bike and a 2hr15 run resulted in a 5hr54min finish and 17th in her age group. 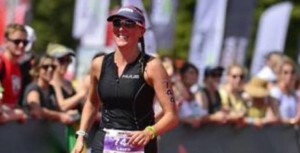 The challenge for Terri, competing in her first full 70.3 was always going to be the tight cut off times at Vichy – 4hr45min for the end of the bike and 7hr30min overall. Factor in that Terri has been unlucky with illness over the winter and this represented a big challenge. So a 58min swim and an excellent 3hr28 bike gave Terri roughly 2hr45min to complete the half marathon – needn’t have worried as she squeezed home with 1min08sec to spare J – great achievement. Continues his rapid rise! Nige didn’t enjoy the swim but did an excellent job of getting himself together and finishing it off and that in itself is no mean feat given that Nige only ventured into the pool in January when he needed a rest after 25m! Not to be disheartened, he went to work on the bike and produced an excellent sub 3 hour bike split before knocking half an hour of his run split from Staffs to finish in an excellent 6hr45min. Still a lot more to come from Nige!